New York Rangers President and General Manager Glen Sather announced today that the club has agreed to terms with defenseman Dan Girardi on a new contract. Girardi, 26, skated in 82 games with the Rangers this season, registering six goals and 18 assists for 24 points, along with 53 penalty minutes. He was one of four Rangers to skate in all 82 games, and has played in 280 consecutive games, ranking ninth in the NHL among active streaks. He led the team and ranked sixth in the NHL with 180 blocked shots, tied for second on the Rangers with 178 hits, ranked second in average icetime (21:29) and third with a plus-nine rating at home. Originally signed as an undrafted free agent, defenseman Dan Girardi has had a big impact on the Rangers over the 280 consecutive games that he has played since his NHL debut in January 2007. Girardi ranked second among team defensemen and ninth on the Rangers overall in even strength scoring, registering 19 of his 24 points at even strength, and he ranked third among club blueliners in goals and points, and fourth in assists. The Rangers posted a record of 4-1-0 when Girardi tallied a goal. Girardi tied his career-high with a three-game assist/point streak from December 16 vs. the NY Islanders to December 19 at Philadelphia (three assists), and he recorded his first career multi-goal game with two goals on October 12 vs. Toronto. On October 3, Girardi skated in his 200th career NHL game, registering one assist and a plus-three rating vs. Ottawa at Madison Square Garden. A veteran of four NHL seasons, Girardi posted his finest offensive output during the 2007-08 season, establishing career-highs in goals (10), assists (18), points (28), power play goals (five) and shots (147). His 10 goals tied for 20th in the NHL among defensemen, and he ranked second among team blueliners in goals, assists, points and power play goals. Girardi also tallied a career-high, three playoff assists in 10 contests in 2008, recording his first NHL post-season point with a shorthanded assist on the game-winning goal in Game One of their Eastern Conference Quarterfinal matchup vs. New Jersey on April 9 at Prudential Center. Earlier that season, Girardi notched his first career NHL goal with a power play tally on October 18 at Atlanta. The 6-2, 215-pounder has skated in 280 career NHL games with the Rangers, registering 20 goals and 60 assists for 80 points, along with 128 penalty minutes. As a rookie in 2006-07, he tied for ninth in the NHL among first-year players with a plus-seven rating, having posted a plus or even rating in 28 of 34 games following his recall from Hartford (AHL) on January 25, 2007. The Rangers completed their 2006-07 campaign registering a 19-9-6 record with Girardi in the lineup. Girardi tallied his first career point with a two-assist performance on February 17, 2007 vs. Philadelphia, and made his NHL debut on January 27, 2007 at Philadelphia. In addition, Girardi has recorded three assists and 16 penalty minutes in 27 career playoff contests. 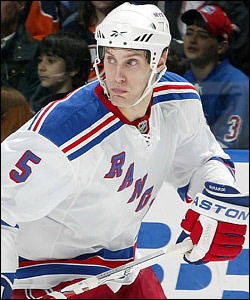 The Welland, Ontario native signed as a free agent with the Rangers on July 1, 2006.